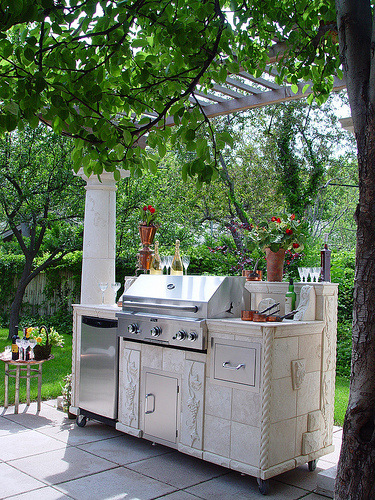 An outdoor kitchen is generally seen as an extension of the interior space. The appliances are meant to compliment those used in the interior kitchen, while the furnishings help to extend the interior living space out into the natural world beyond. In this way these spaces can help to bridge the gap between the indoors and the outdoors, providing a much needed intermediary between the two locations. One of the main features of an outdoor kitchen are the different appliances that can be used for cooking, which are often not available or appropriate for interior spaces. Things such as barbecue grills, pizza ovens and open flame cooking ranges can not usually be used in interior spaces. That means that an outdoor kitchen can actually extend the culinary possibilities of the chef, allowing them to create food for the family which otherwise would not be possible. By definition an outdoor kitchen can be any exterior area that has some sort of cooking appliance. However in practice there are many different features that will slowly define a space away from being just a porch with a grill, into the realm of being a full fledged outdoor kitchen. This includes features such as awnings, bars, brick flooring, sinks, mini refrigerators and storage areas, all of which can combine to allow a chef to prepare delicious meals without any need for the interior kitchen area. When it comes to design, many people choose to style an outdoor kitchen so that it closely matches the indoor space. This often includes using the same or similar materials in both spaces. Hardwood cabinets and storage areas, granite counter tops, and outdoor friendly furnishings printed with patterns similar to those used in the interior space, can all help to draw the overall look of the home together into a congruent whole. The way that the space is specifically set up should be led by the function that the homeowners would like it to perform. If it is just going to be mainly a cooking and food preparation area, than the emphasis should be on storage, tools, and utensils. If you plan instead to make it a primarily social area, then you will want to open the floor plan up so that you will be able to fit a lot of people into the area. Some people choose to use an outdoor kitchen as a staging area, set between the interior and the exterior, with the outdoor dining being done at a picnic table out in the yard. There are also many possible features that you need to consider before you undertake the construction of an outdoor kitchen. Typically the work of building one from scratch will cost between $10,000 and $20,000 although that can go up or down depending on whether you do the work yourself, which features you choose, and the kind of construction and flooring materials that you choose. Aside from construction, materials, and installation, you will also have to consider the cost of furnishing, and then maintaining this area. Appliances, tables, chairs, and other furnishings will end up being a significant portion of your overall cost. Stone and brick will also need to be sealed periodically, while many types of hardwood need a waterproofing treatment year to year.